The story behind Wolverine Boots began over 125 years ago with founder G.A. Krause’s dream of finely crafted footwear made from the best of materials. Their original masterpiece, the first of its kind 1,000 Mile shoe advertised a thousand miles of comfortable wear. They upheld these standards of authentic craftsmanship and superior durability, and the boot became a staple of the 20th century wardrobe. Over a century later, the company continues to uphold that tradition with their 1000 Mile collection. Mid-october, they will be released the 721LTD boot, an homage to the original 1,000 Mile shoe. Made with the same attention to detail and master craftsmanship, the boot will feature the 721 imprint as an homage to the original. 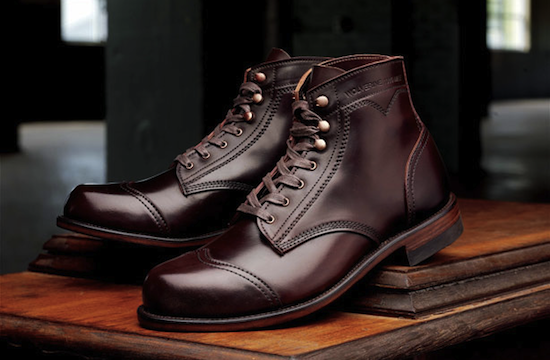 Being handcrafted from Horween Shell Cordovan leather and using the same 300+ step process as a century ago, these boots should give you well over a thousand miles nowadays. Best yet, Wolverine has remained American made and Michigan owned since their inception in 1883. See the full collection at Wolverine 1000 Mile. Check out their video after the break for a peek into the incredible craftsmanship that goes into these boots.